Look Bethlehem up on Google and you find questions such as “Is Bethlehem in Israel or Palestine?” – proof of the ignorance that surrounds it. The answer? 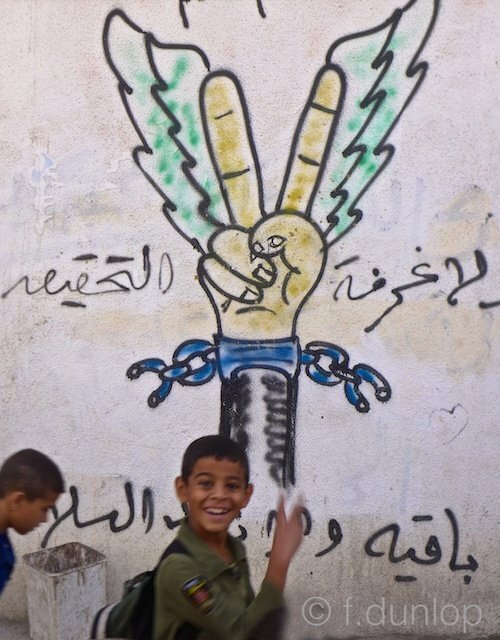 It’s in the West Bank, part of the Occupied Palestinian territories, and hemmed in by Israel’s infamous separation wall. 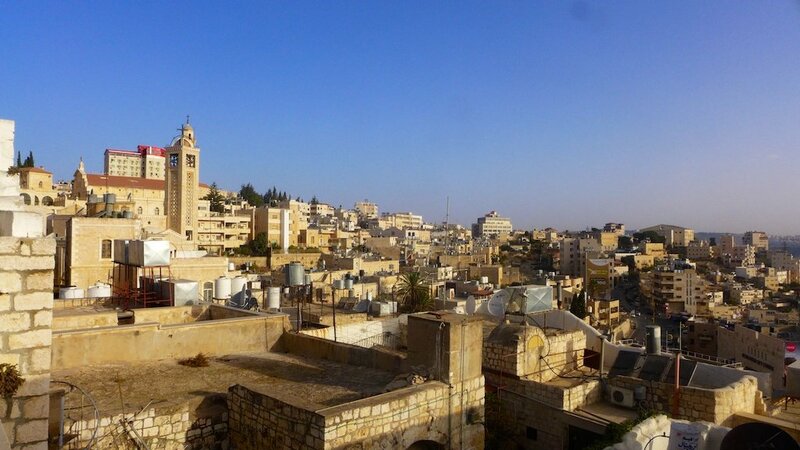 Yet there’s an unexpected quirkiness, friendliness and intimacy about Bethlehem. Far from being merely a hallowed pilgrimage destination, it is a bustling city of 40,000 people, majority Muslim and 12% Christian (50 years ago it was 85% – many have left). And yes, Manger Square really exists, the hub of churches, convents, cafés, shops, a mosque and taxis. If only Bethlehem’s taxis had meters, life for the independent traveller would be easier – these yellow saloon-cars are adept at rip-offs, so beware. The opposite is the case with the services, shared taxi vans for longer trips, where an exact fare is charged. And any street-vendor will smilingly hand you a taster of their specialty – for free. Swings and roundabouts. 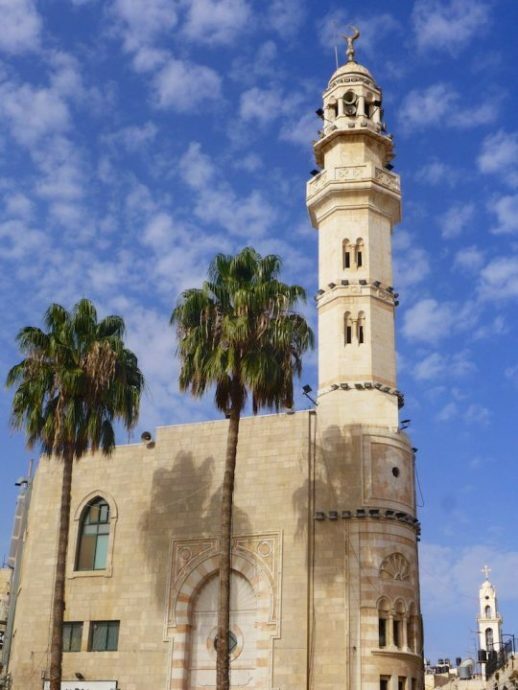 I love the way the Mosque of Omar faces the Church of the Nativity across the square – two faiths watching each other without animosity (here at least). 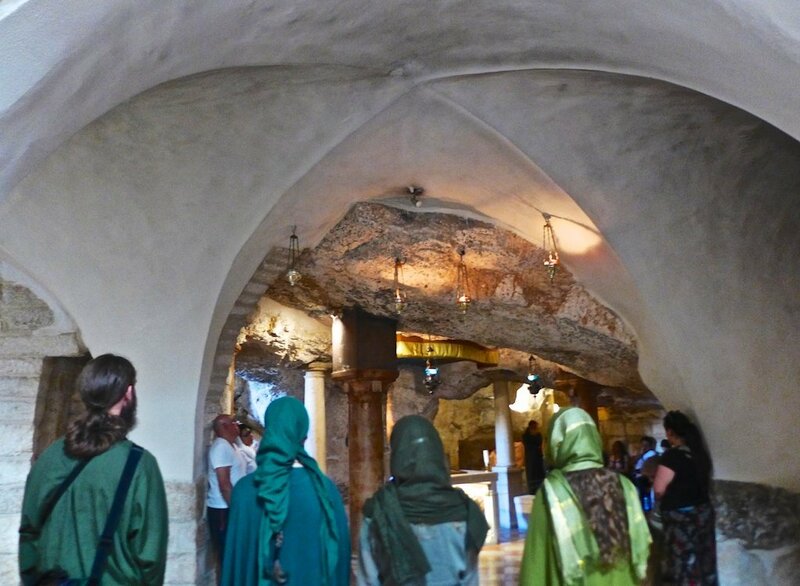 During the day, troops of Christian pilgrims bussed down from Jerusalem throng in the plaza beside the church, before squeezing inside through a tiny archway – quite the opposite of the grandiose portals of European cathedrals. Most are eastern European (often Russians) and Asians, though some Western Europeans too. 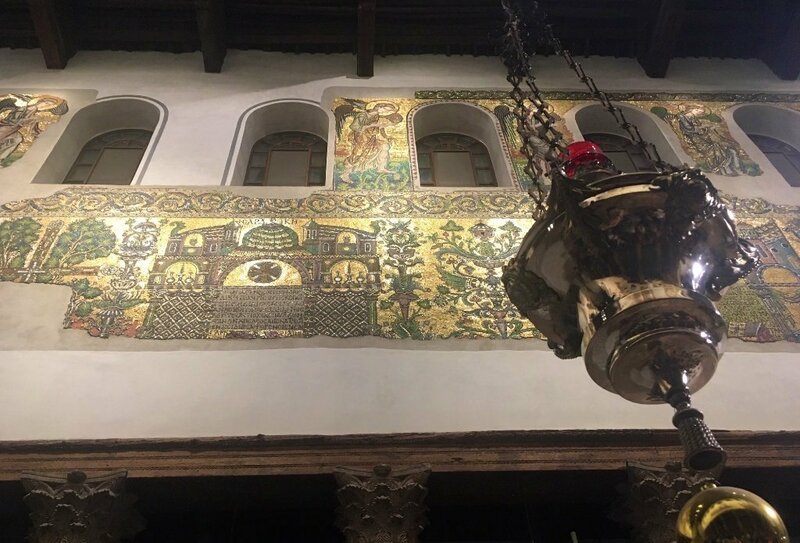 Once inside, they fill the beautiful nave between columns and lamps, oblivious to the surviving Crusader mosaics high above, all focused on seeing the manger – an underground cave where ancient Canaanites once held fertility rites. When I came here ten years ago it was easy to visit – this time I don’t bother. Instead I go to the Milk Grotto (named after a drop of Mary’s breast milk, said to have coloured the cave walls – another quirky myth!) to see another cave, another fertility cult site. 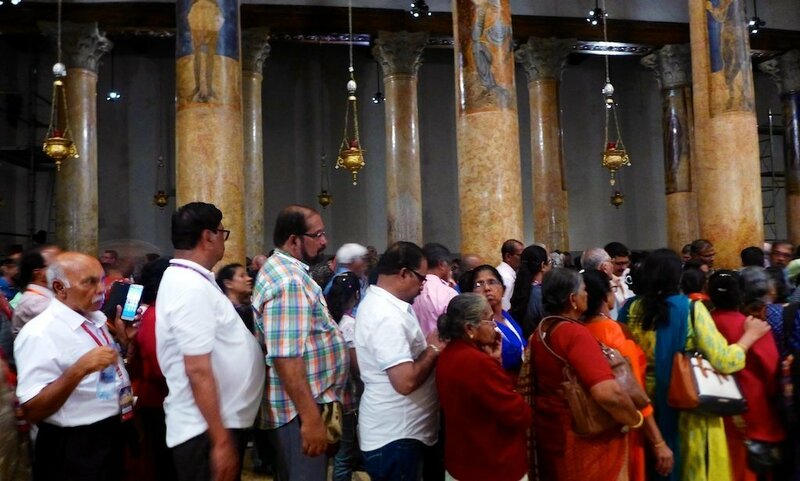 Down steps, I find a cosy, vaulted space containing several shrines and small groups of worshippers who await their turn to sing their faith. As I arrive, four young people in Biblical robes are singing Silent Night a cappella – it’s incredibly movingly. They turn out to be German – with that shining light of belief in their eyes. 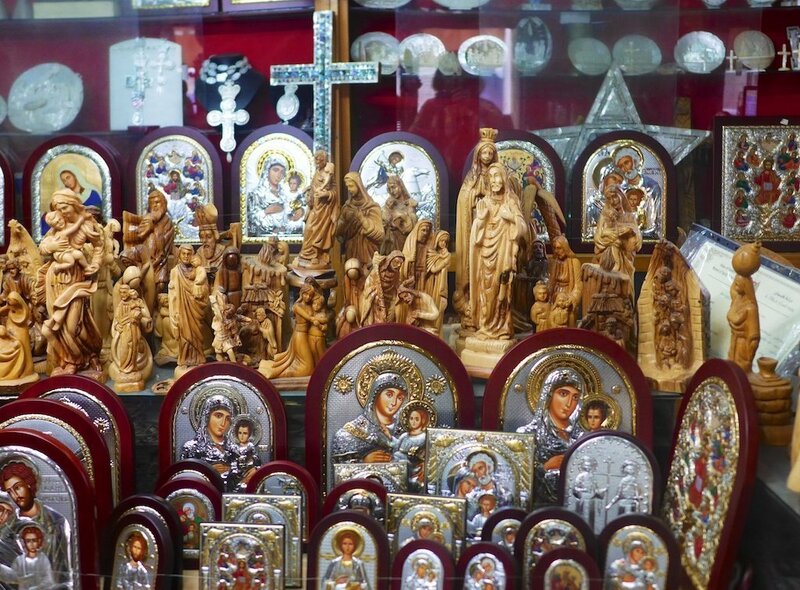 Shops in well-trodden central Bethlehem sell anything from olive wood crucifixes to gleaming icons (no doubt a hot ticket with Russians), to statues of Mary, Hebron pottery, leather and keffiyehs. Dodging persistent shopkeepers becomes an art, particularly when heading up Manger Street from the square to reach the cornucopian farmers’ market. 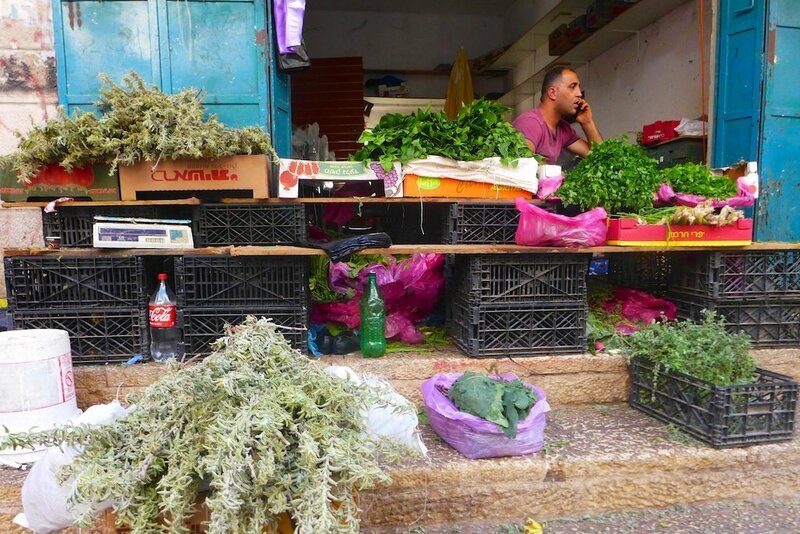 This I visit again and again to admire the fresh, gleaming produce – pomegranates, avocados, fragrant herbs, radishes, oranges, limes, eggplants – and daily hub bub. 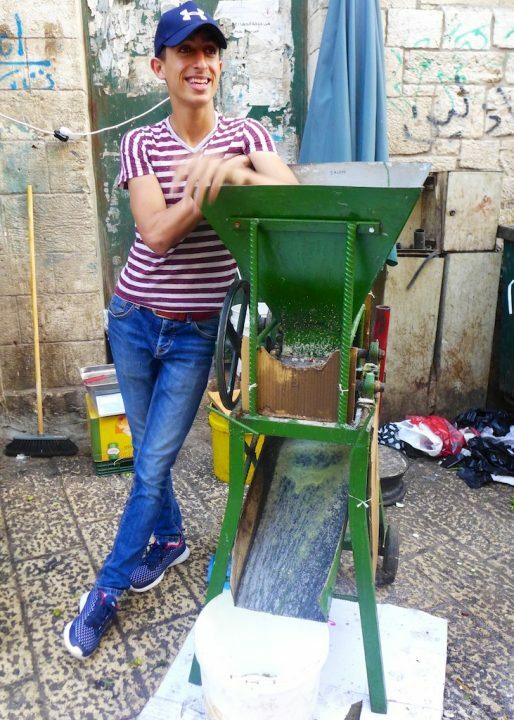 Beyond the market, up more steps (Bethlehem demands stamina), I follow the twists and turns of Pope Paul VI Street to Cinema Square, a stretch of the Old City where shops sell fish and dates from Gaza, glittering gold jewellery and even press olives into oil in front of you (below). There’s plenty of garbage and graffiti too, making it local and authentic, far from the shiny tourist tat surrounding Manger Square. However temptations come with the visit: Mine is to head into the desert to see Herodion and Mar Saba, both ancient, spectacular monuments. After hard bargaining, I negotiate a round trip by taxi with waiting time at both sites for 170 shekels (about £36 / $47). Probably not a bad price. 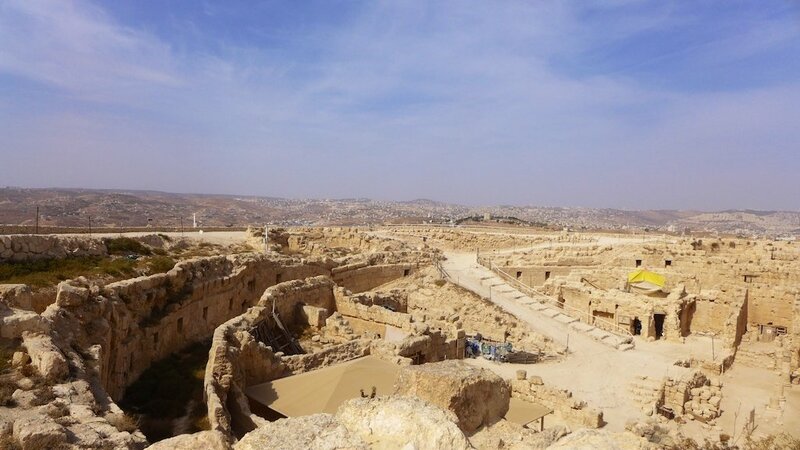 Herodion (Herodium) comes first, about 20 minutes’ drive beyond the upscale neighbourhood of Beit Sahour, a towering mountain-palace built by King Herod in around 20BC. In a typical anomaly of the West Bank, I now find myself in Israel, its flag flapping in the breeze at the top, and pay a 29-shekel entrance fee to a grumpy guard. Luckily taxis can park close to the summit which leaves a 10-minute or less climb to the palace ruins. 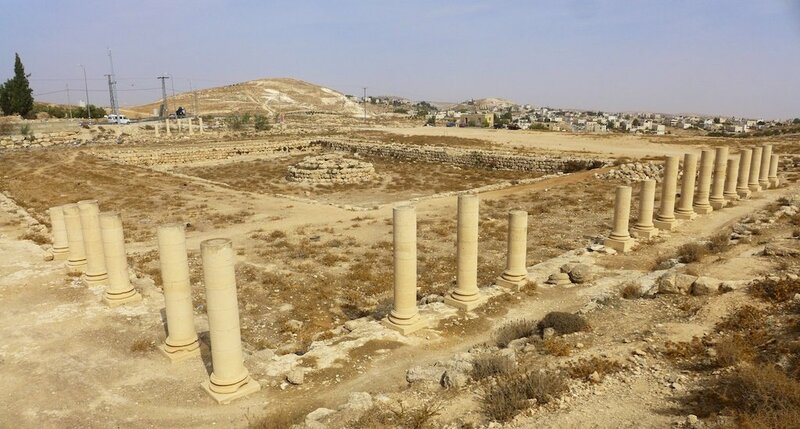 Within the encircled site, Herod’s reception hall is visible, as well as Corinthian columns, a bathhouse, a synagogue and ongoing excavations. Far-reaching views from the brink reveal a bleached universe stretching to infinity studded with Israeli settlements, kibbutz and Palestinian villages. 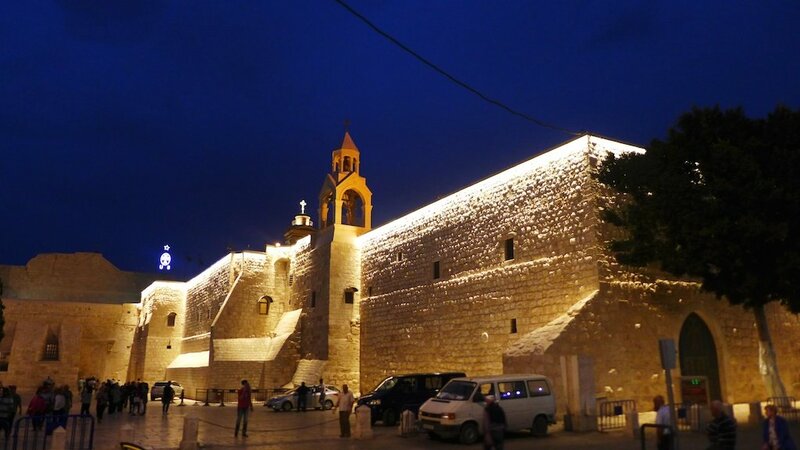 Here in this 2000-year old fortress, I find myself completely alone, lost in the millennia – in high contrast to the bustle of central Bethlehem. Equally extraordinary is the network of tunnels that riddle this artificial mountain. 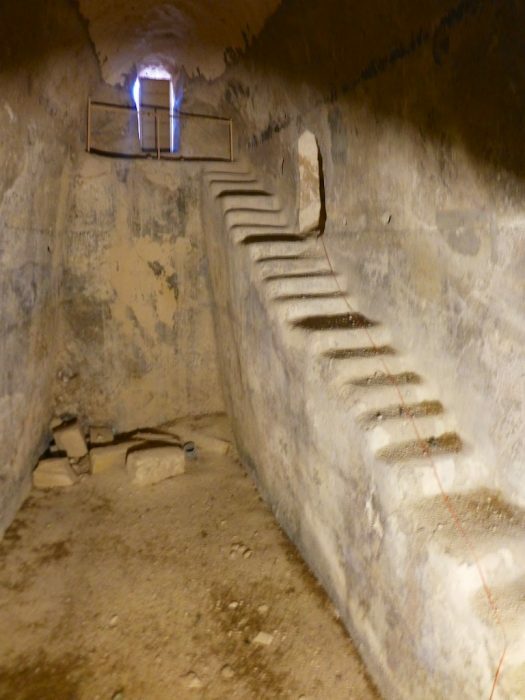 As I descend staircases which circle down through the gloomy interior, I pass huge cisterns dug out to feed the palace. 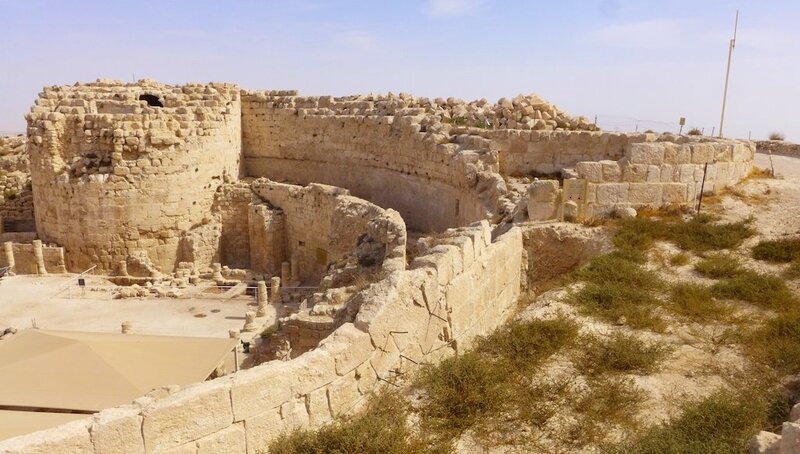 Blinking in the sunlight on emerging, I continue round the side to see a small amphitheatre and, allegedly, Herod’s tomb. Another myth? Who knows, this is the “Holy Land” after all. What isn’t a myth is the occasional roar of Israeli fighter jets overhead keeping an eye on the Jordanian border. After admiring the bathhouse and colonnaded funeral complex of Lower Herodion at the base of the hill, it’s on to Mar Saba, far to the east. 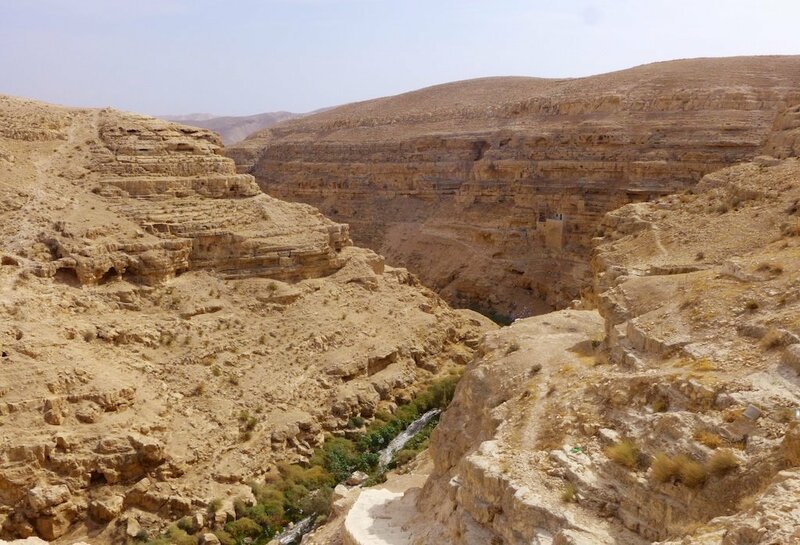 Now we really enter the Judaean desert of rolling, rocky hills and striated cliffs sliced into canyons by wadis (river-beds), an arid terrain that stretches to the Dead Sea and Jordan beyond. Now I understand why it’s also dubbed a wilderness. After negotiating a twisting track we come to this incredible, remote monastery (above), clinging to a cliff overlooking the Kidron river. Originally 5th century, over the years the monastery went through countless highs and lows, expanding and contracting, losing St Saba’s body to the Crusaders but recovering it from Venice in 1965. Much of the jigsaw of buildings was restored by the Russians in the 19th c, so it looks quite fresh. I’m told less than 20 monks now live there – II wonder for how long. Being Orthodox, women aren’t allowed in, so I resign myself to climbing an opposite hill to a stone tower with bird’s eye view of the complex. Photos spell out its beauty, but being there with a gaggle of monolingual Russians in head-scarves and long skirts makes the experience other-worldly and memorable. 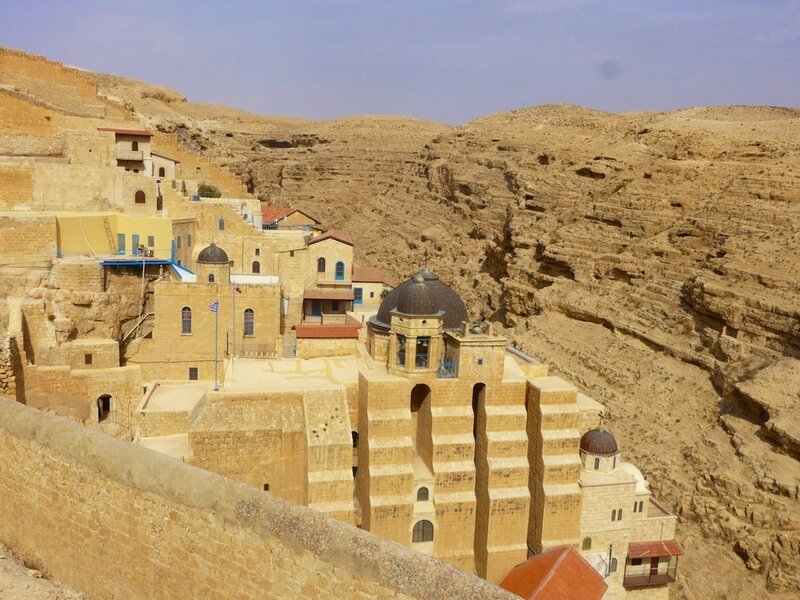 My photos give an idea of Mar Saba, but can’t communicate the majesty of its setting. nor the immensity that surrounds it. 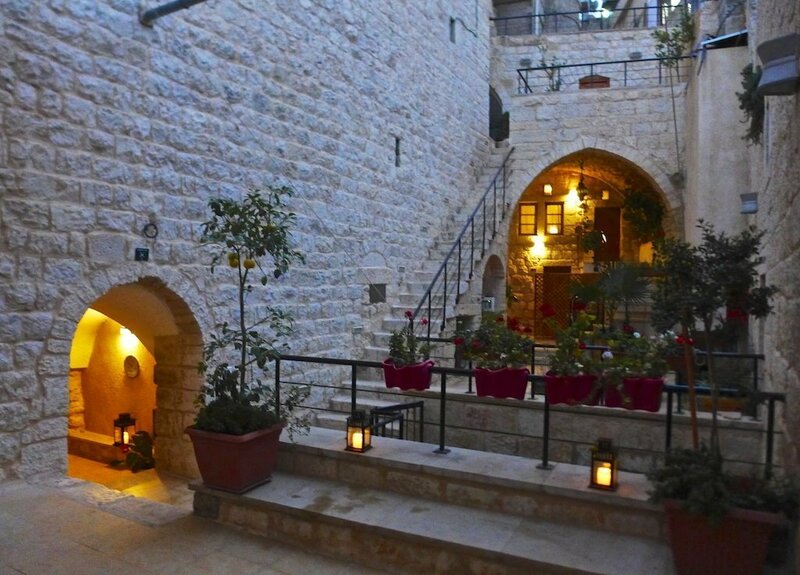 Back in Bethlehem’s atmospheric old city, I return to my cosseting boutique guest-house, Hosh Al Syrian, a beautiful Ottoman building of terraces, stairs and patios that was once a guesthouse for Syriac pilgrims. In my vaulted room, one window opens onto a broad external staircase descending through this ancient, legendary and labyrinthine town. 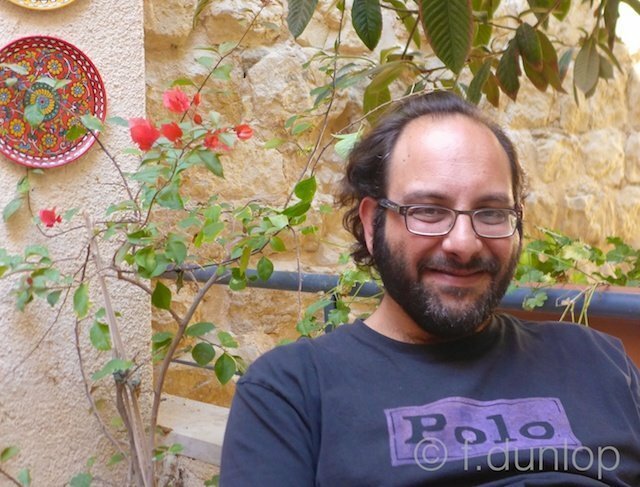 Collapsed on my bed, I listen to chirping sparrows, the chatter of schoolchildren passing by, the tolling of church bells and the haunting call of the muezzin. 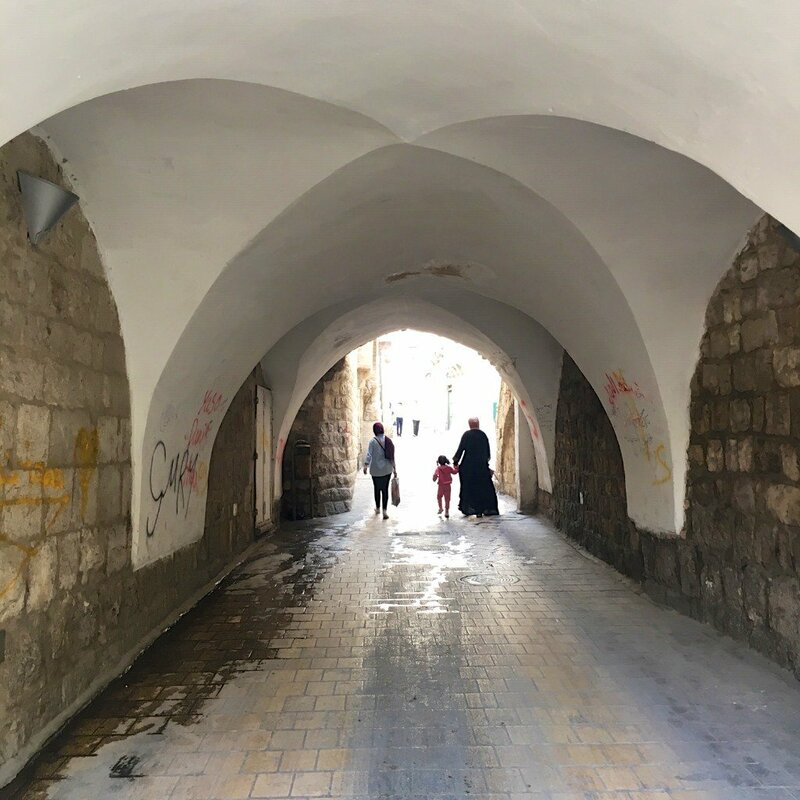 Bethlehem feels alive – and I feel very comfortable within it. 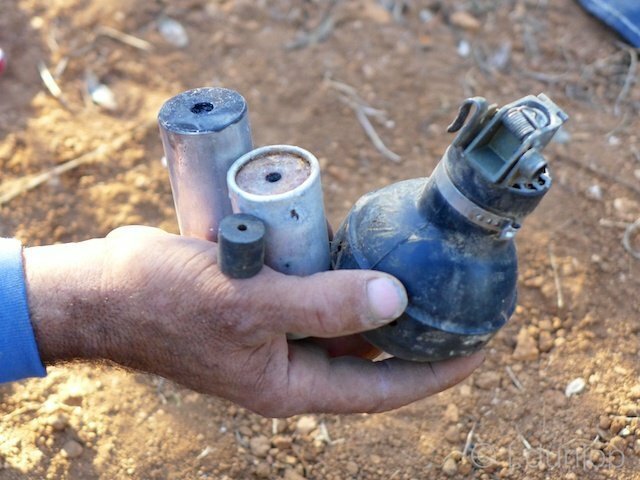 The only problem for the Palestinians – and it’s a big one – is the wall.